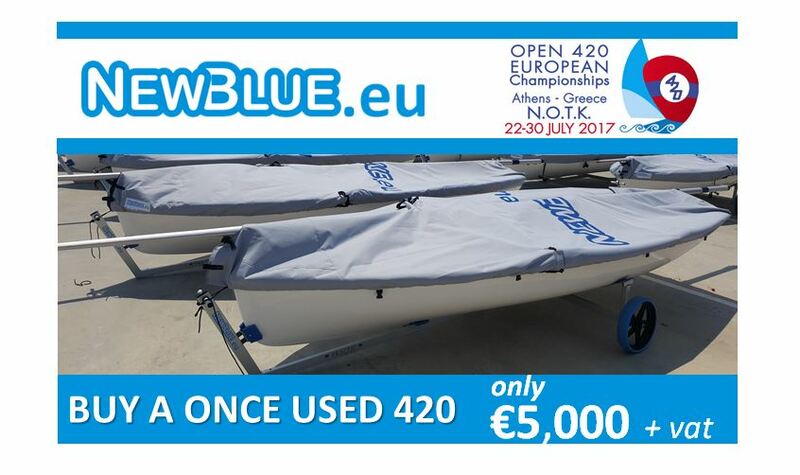 All change on race day 3 at the 420 Open Europeans in Athens, Greece, as the breeze kicked in and the race track got just a bit more exciting, compared to the previous light wind days. 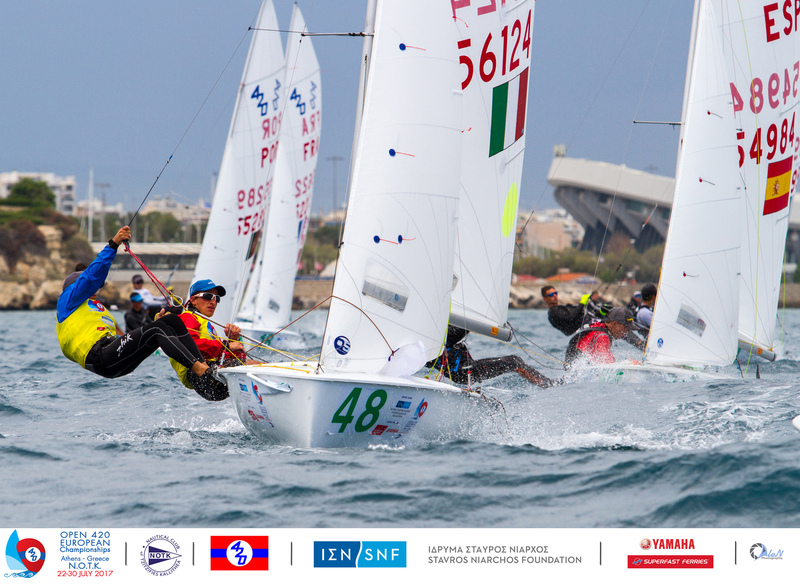 The breeze was around 19-21 knots, gusting up to 25 knots when racing got underway. As the afternoon unfolded, the breeze decreased, before returning to a challenging 20 knots. 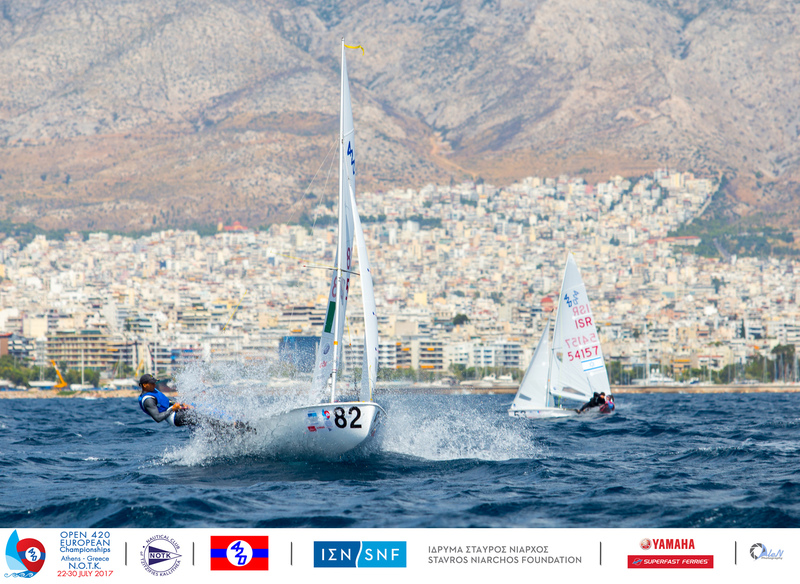 The sea was lumpy, with the top reach the most thrilling part of the race track as teams steamed down to the gybe mark. A few capsize and broken rudder casualties were the only consequences of a fantastic race day. 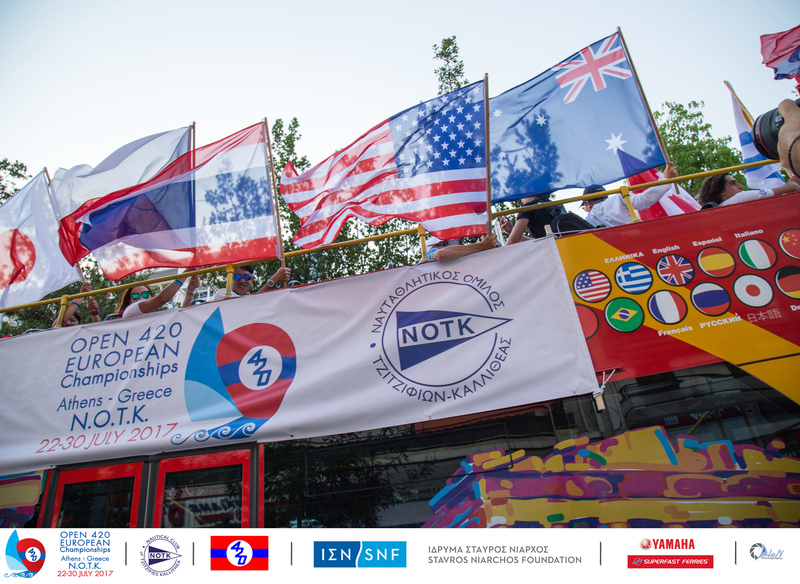 The 179 teams from 22 nations now reach halfway stage of the Championship, so time to assess placings as they seek to consolidate and seek out every incremental gain over the next three race days. 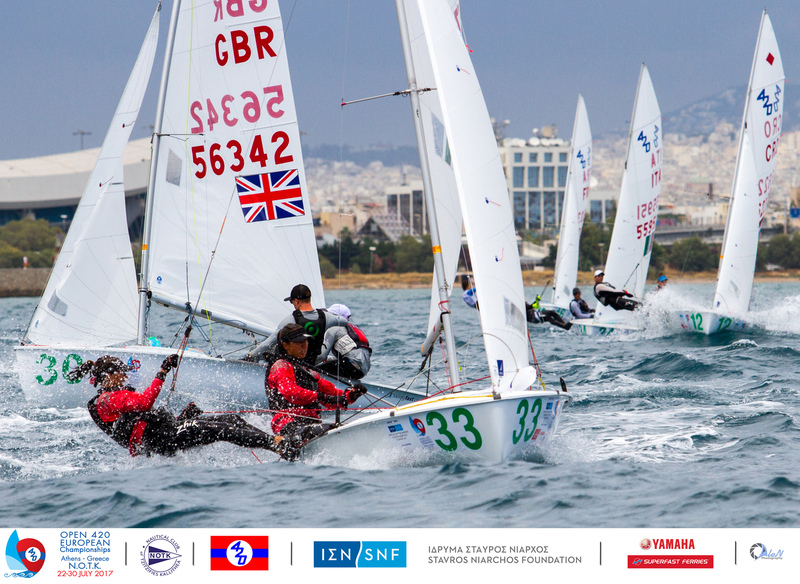 In the Open fleet, the 77 teams will be split into gold and silver fleets for the final 6 races, whilst the Ladies and U17 fleets continue their 12-race single series. Racing is scheduled to get underway at 1400 hours with 2 races for all fleets on Friday 28 July. 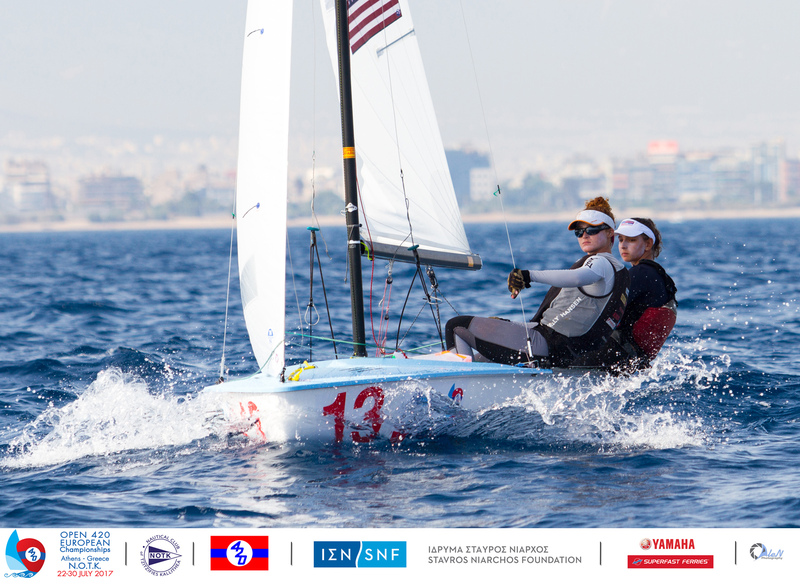 Emma Kaneti/Ciara Rodriguez-Hora (USA) scored another race win, partnered with a discard score, after finishing 31st in the second race of the day. The conditions were frisky, make one mistake and you were right back in the fleet. Their phenomenal scorecard until today’s finish still places them on a 16 point advantage. 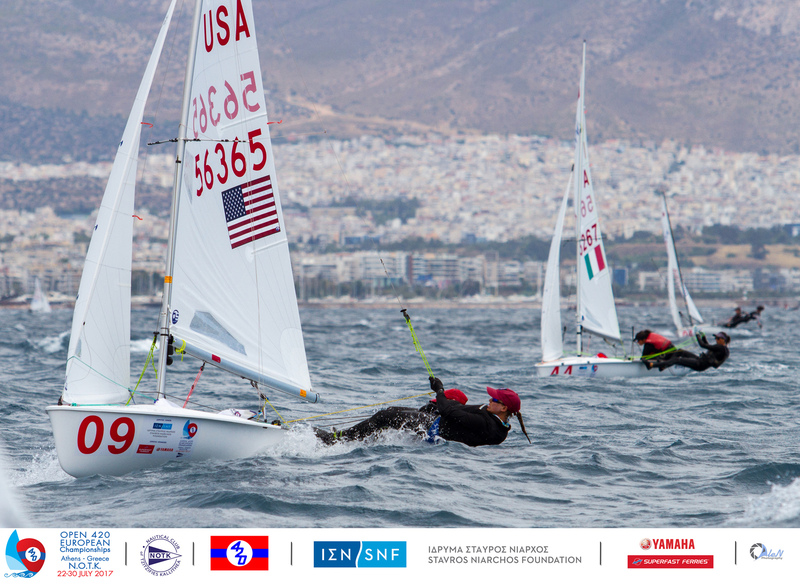 “We are happy to stay at the front of the leaderboard for sure, as we had a pretty rough second race,” said Kaneti. 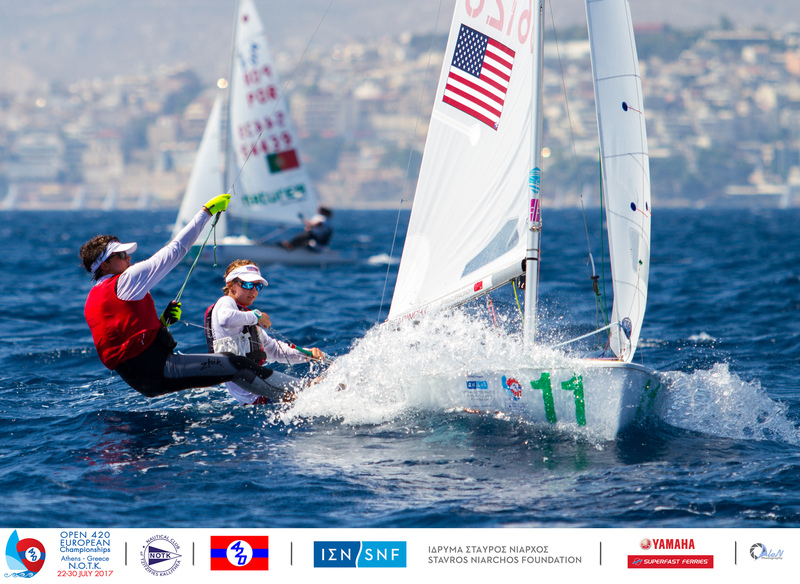 “We didn’t have a great start, but we have been consistent so far so are happy with how we are sailing. 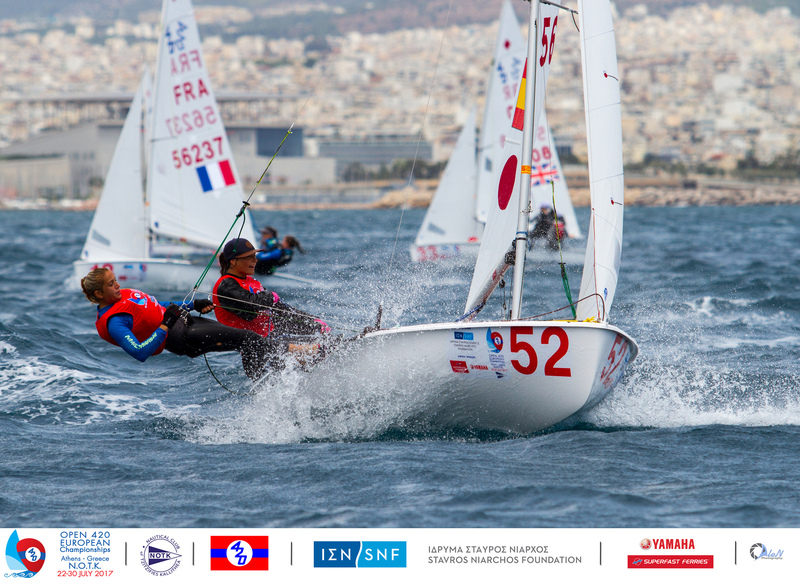 Holding on close behind, but with a growing points deficit are France’s Violette Orange/Camille Orion, chased hard by the USA’s Carmen Cowles/Emma Cowles, who clamber back up to third and sit just 1 point behind from today’s perfect scores of 2,1. “It’s an incredible event, a lot of competitors and a real experience to be here,” commented Orange who is a familiar face at international events. 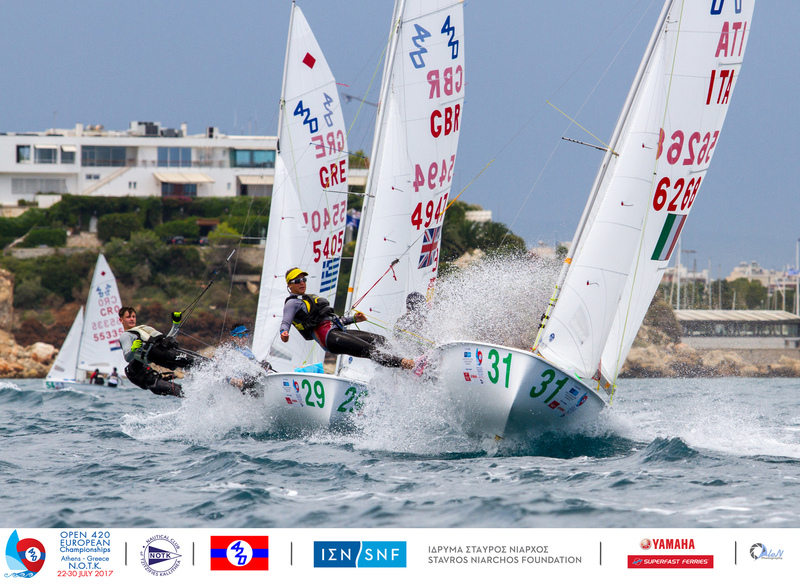 Hatty Morsley/Pippa Cropley (GBR) picked up their first ever win at an international event yesterday, and repeated form today to seize a third place in race 5, following up with a 32nd, to sit in 6th overall. 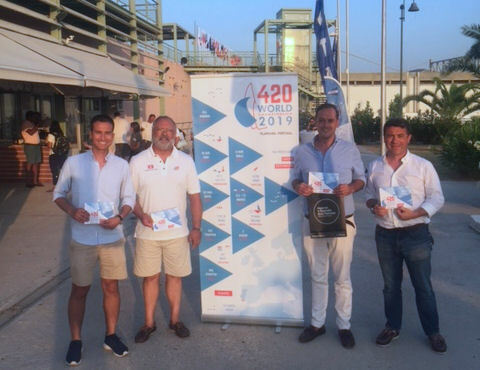 The pair’s eyes are targeting a top leaderboard position at the 420 Europeans, which they hope will convert to secure their place to represent Great Britain at the Youth Sailing World Championship in Sanya, China later this year. A leaderboard charge from France’s Juliette Dubreuil/Alice Cousin, who relished today’s big breeze and easily grabbed two top ten results, in contrast to their scoreboard which is otherwise littered with high scoring finishes. The pair leap up to 20th from 33rd. It’s been a bit like a waiting game, anticipating the inevitable rise of Italy’s Edoardo Ferraro/Francesco Orlando. 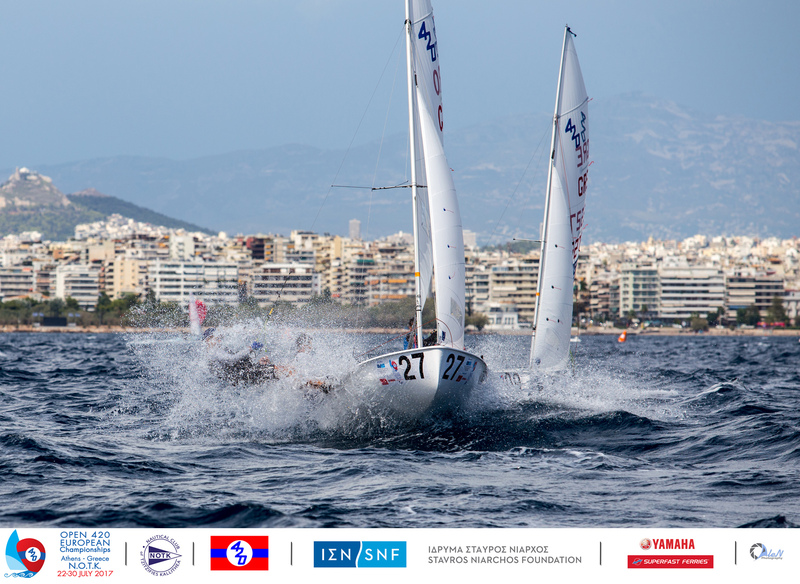 Today they bounced into the lead, with race results of 1,3 in the blue fleet. 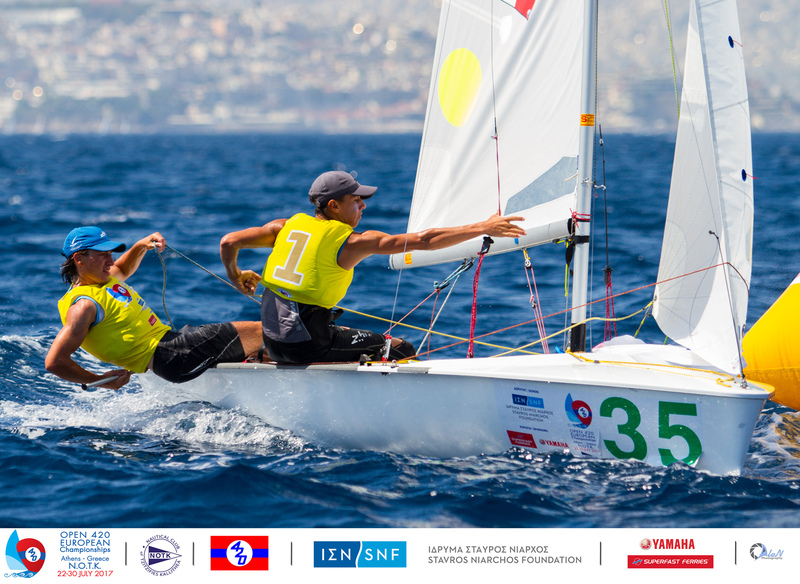 The duo sit on a small 5 point margin over team mates Andrea Spagnolli/Kevin Rio, who scored the same results but the other way around, 3,1, in the yellow fleet. “It was a very good day, with two difficult races,” said Ferraro. “In the first race there was such a lot of wind, but in the second there were two different winds, and on the right it was light and on left strong wind – it was so different. 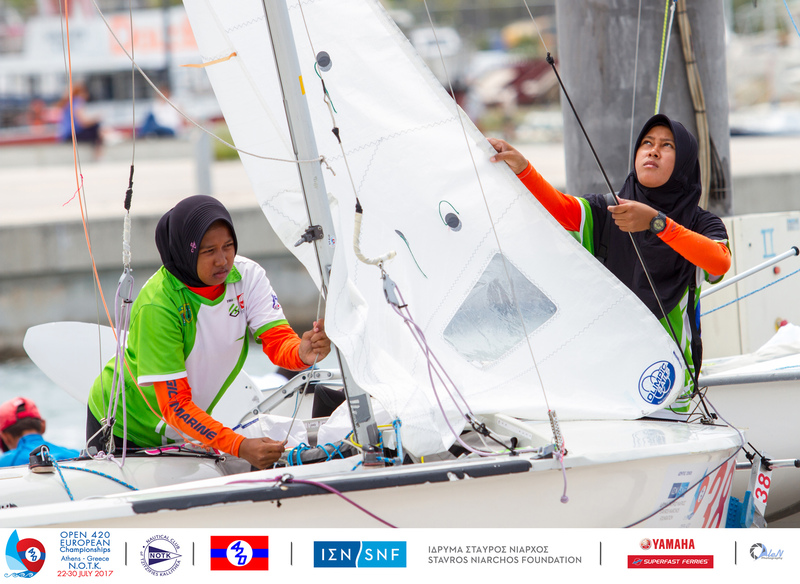 “We were in trouble in the first part of the second race, but with some good tacks and gybe by gybe we caught the group. “In this next three days, we must be aware, and we must be just a little bit scared, because the boats behind us are very good teams. We have the Italians, our friends, and the Greeks were last year’s U17 World Champions,” he concluded with an appropriate measure of respect. 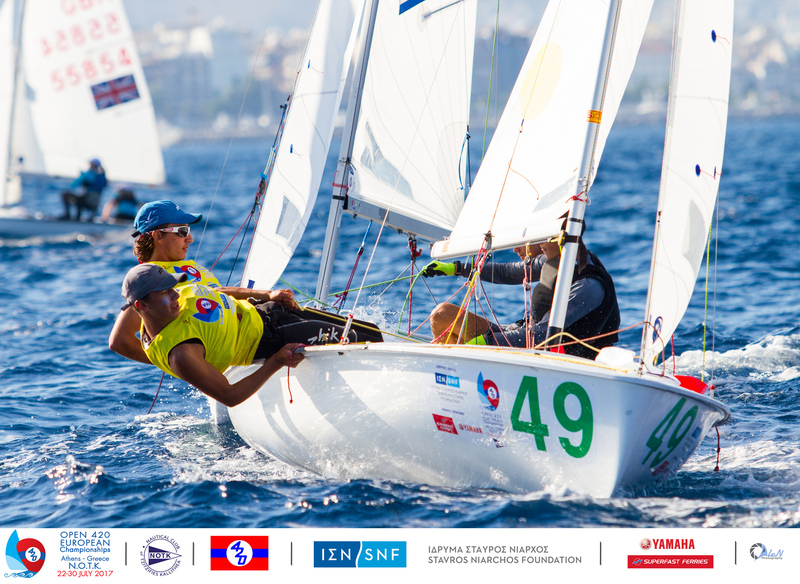 Overnight leaders Carlos Balaguer/Antoni Massanet of Spain struggled in the opening race 5, scoring a 19th and their worst finish of the series so far, but responded in the final race with a 2nd place. “There is a lot of pressure difference and shifts on the race track, but we really like racing here,” added Balaguer. Their day didn’t quite turn out as planned as they slipped to third, but are still well on target for a top finish. 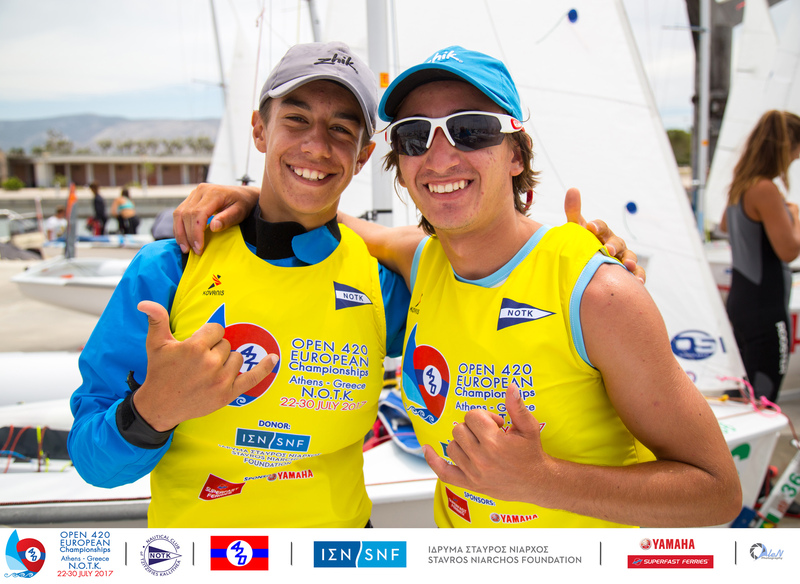 The pair is already selected to represent Spain at the Youth Sailing Worlds, so just have to focus on their own racing here, without the added national selection pressure. 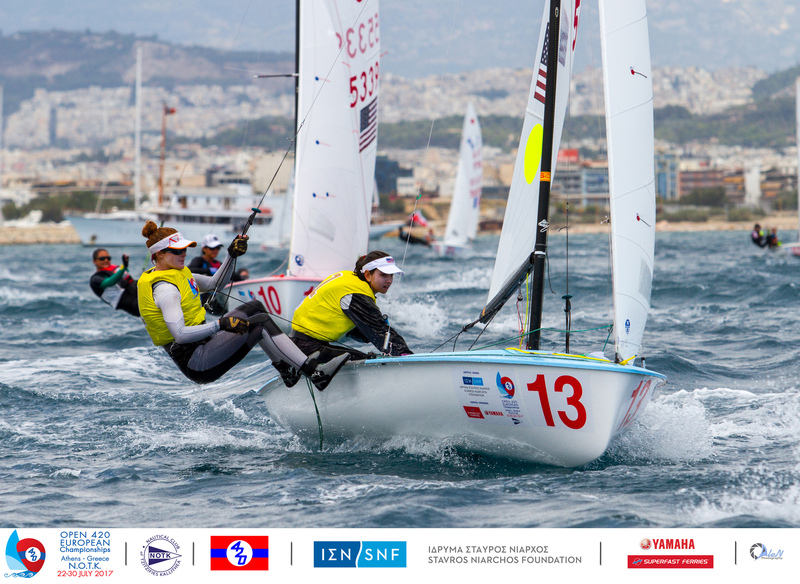 The top thirty-nine teams now advance through to gold fleet, and relief for Australia’s Cole Tapper/Thomas Green who qualify through as the 39th boat. 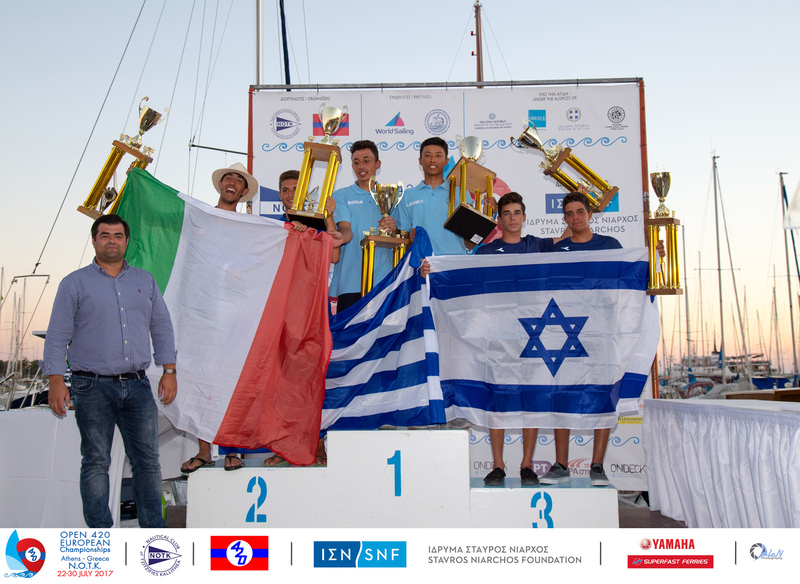 A cracking race day for the USA’s young pairing of Max Anker/Leyton Borcherding who took out both race wins and sit in 2nd overall at the halfway stage of the Championship. 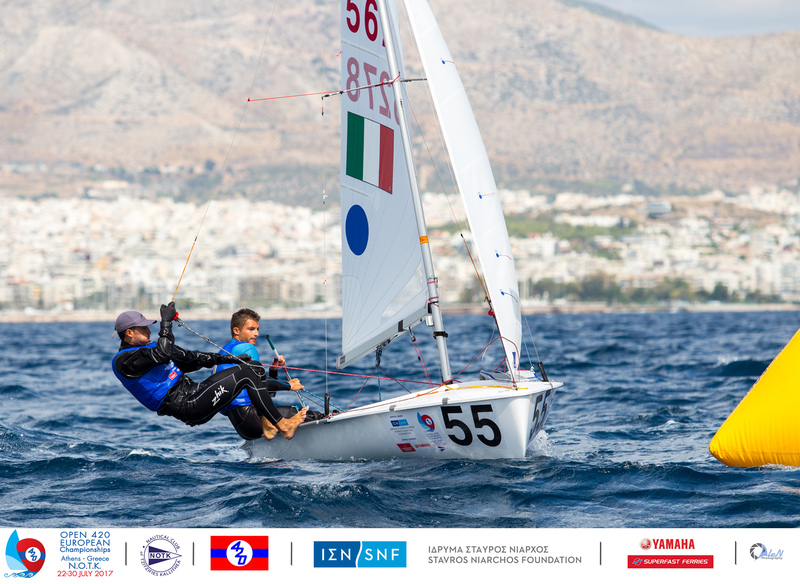 Five points ahead are series leaders Demetrio Sposato/Gabriele Centrone, with Germany’s Bjarne Studt/Piet Strohm holding firm in third. 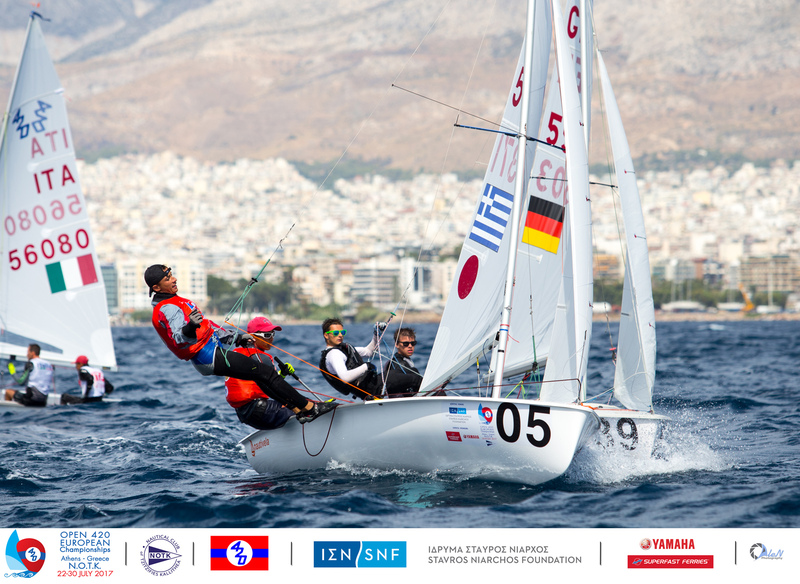 Third placed, Studt/Strohm from Germany continue their super consistent rhythm. 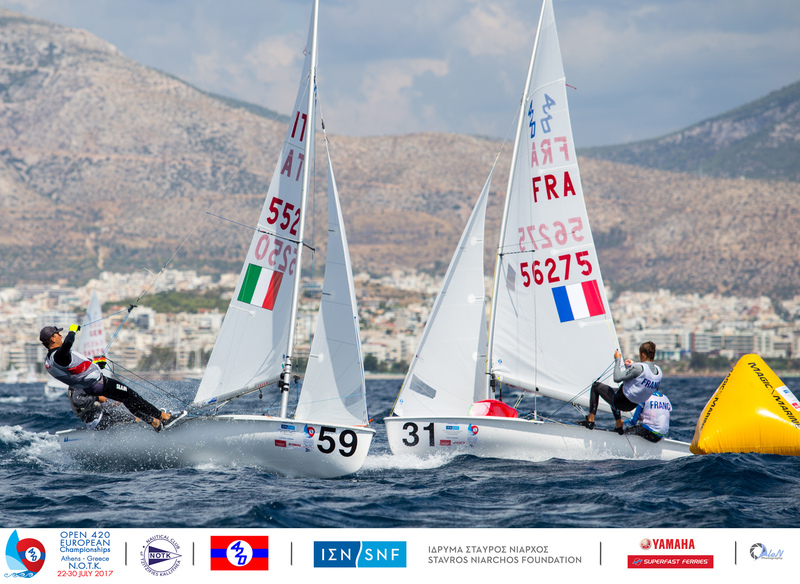 Carlotta Scodnik/Camilla Scodnik of Italy continue their run as top girls team, and shift up to 4th overall from scores of 2,7.